Herodion - What Do You Know About Herodion? The site of Herodion, the fortress and burial place of the Edomite King Herod, lies 10 km east of Bethlehem. It can be reached via the road that passes Beit Sahour to Taqu' village. The mountain rises 758 meters above seal level overlooking Jerusalem and Bethlehem and commanding a view of the Judean Wilderness and the Dead Sea. The mountain and most of the buildings at the site were constructed in the Early Roman period, particularly during the reign of Herod the Great (37 - 4 BC). The work was completed around 20 BC. It is the only work of Herod that bears his name; later on it became his mausoleum. The Arabic name, Jabal AL Freidees, is similar to the name used by some European travelers, Mountain of the Franks. Others interpret the name Freidees to mean paradise derived from the Arabic "Fardous": a name referring to the magnificent garden that was built by Herod at the foot of the hill. Archaeological excavations at the site have uncovered many buildings belonging to different eras whether on the hill or at its foot. An elaborate water system and 15 meter deep wells were also discovered. There is also a big water basin, to which water was brought on the backs of animals from the foot of the hill. Secret tunnels used for escape in case of danger were also uncovered. Complete bathrooms belonging to the Roman times, churches, buildings, and other archaeological remains of successive eras, particularly the Byzantine, were also found. At the foot of the mountain, Herod built grand Roman garden 110 X 145 meters square. The center of the garden was occupied by a big pool (70 X 45 meters). It is believed that the pool was used for swimming and sailing of small boats and as a strategic storage of water. Out of the prominent discoveries in these parts are a number of palaces and their annexes most of which are concentrated around the pool. These belonged to Herod's family, his friends, and the employees of his administration. At the peripheries of this building there is a 350-meter long road. 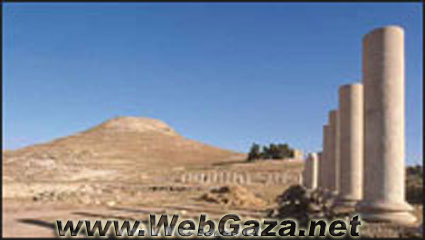 Archaeologists think that is was built especially for the purpose of the funeral ceremony of Herod. However, the tomb itself remains undiscovered.